Our easy to use shopping cart will guide you through the journey of purchasing your new kitchen. 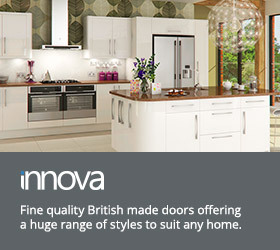 Why not use our unique ‘Style your own kitchen tool’ to help you decide which door style, worktop and handle you like. Give our ‘Unit & Door Configurator tool’ a go to view different door styles with different colour cabinets. 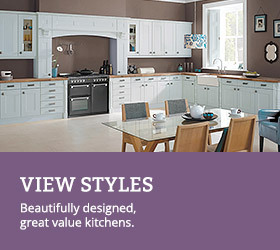 Once you have decided which door style and cabinet colour you like, start adding items to the shopping cart. 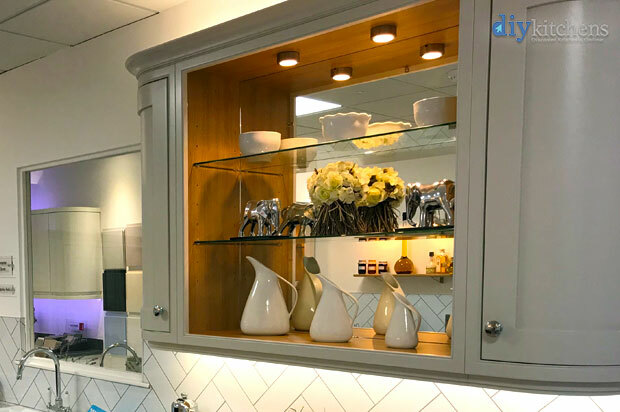 Don’t worry too much at this stage if you haven’t made your final decision on your door style and cabinet colour as these can be changed within the shopping cart. To find out more see ‘Easy online ordering’. Hello if I place an order and realize that I have forgotten items, can I add further items to my order prior to delivery? Hi Richard, once you place your kitchen order, you get 48 hours in which to make any amendments. All carcases are 18mm thick with 8mm backboards for a larger service void. If you are looking to buy just doors off us then you will need to look into the doors category and price the doors in this section. If you are looking to just buy our carcases then this is not something we offer i’m afraid. I am in the planning stage to fit out my utility room and have a number of questions which I hope can be answered. Firstly, why can I not buy a tall broom unit to house an ironing board. Ironing board height is 1m60 and there is no exact measurement for carcass of this unit. Secondly, What is the measurement of the shelf depth in a 300 wide larder or 600 wide larder. Thirdly, I want to house my boiler but there is no cupboard high enough . The tallest one you do is 900m which is too small and then you suggest using a tall larder cupboard. This is not suitable as I have a worktop underneath the boiler . Any suggestions? Hi, the height between the base and the internal shelf is approx 1220mm. if you order the unit “dry assembled” you can remove the internal shelf and have usable height of 1934mm. your fitter may well re fit the shelf at an appropriate height. The depth of a larder unit standard shelf is, 510mm Boilers are different sizes but if there is a door available i.e. 1245mm x 597, or 980mm x 597 we can make a carcase to fit. 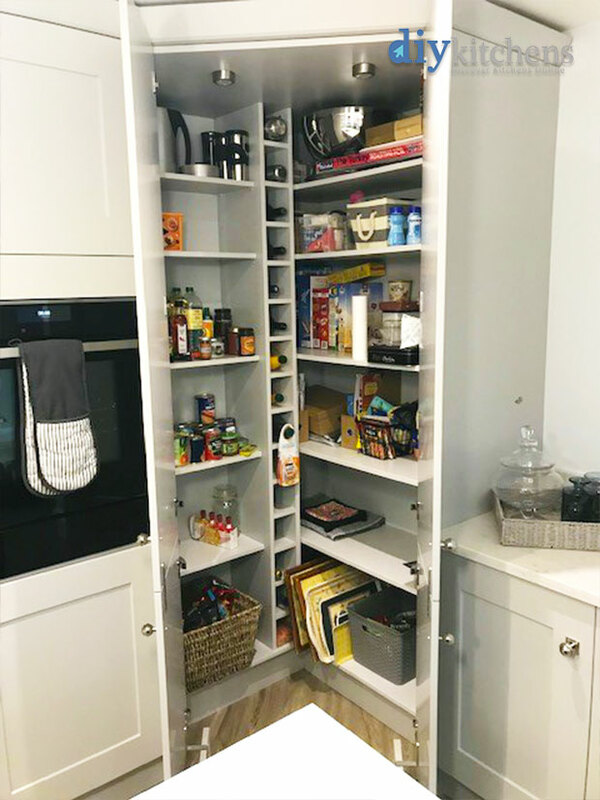 let us know the size of cupboard you require and we can advise (01977 608 418 or sales@diy-kitchens.com). In some of the styles there is the option of having the large door to the top. If the option is not given in your choice of kitchen, add a note into the amend option box and request that the small door id fitted to the bottom. Can I change the doors from left hand opening to right hand opening simply. The quick answer is no, you would need to hinge jig holes in the other side of the unit and on some door designs move the door hinges as well. How can I change the door style in my cart for all units already in it without having to add the same units again with a different door style then remove the ones with the old style? In the top right hand corner of the website you’ll see a shopping cart with a number of items in and a cost. Click on this. Next, above the title “Shopping Cart” you’ll see 3 buttons, click the one on the right called “Change Kitchen Style”. Now, choose the new style that you require from the drop down box and click on the “Change Style” button. Finally, click on the “View Cart” button to see the changes. 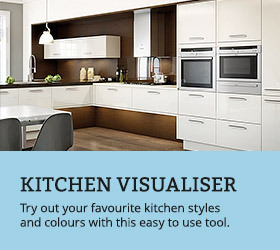 Hi, your kitchen visualisation application has a bug, its not possible to view the kitchen in Broadoak Ivory, which just happens to be the one I’m interested in…. Thanks for letting us know. I’ll pass the issue onto our technical team to try and get it fixed. Hi, it is now fixed. 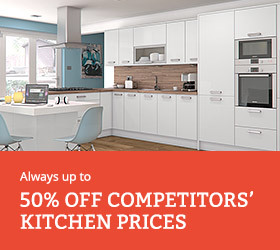 I placed an order with you nearly 3 weeks ago for a new kitchen in Luca Gloss White. I wanted t0 put aluminium glazed bi folding doors on 3 wall units which measure 500 wide x 720 high, I was told by one of your sales team that the ones that I wanted instead AE715HG would not fit, despite being told earlier by one of your sales team that they would fit. Can you please advise of an alternative, as last week when I asked the young lady on the phone she did not give me the reference of an alternative. As I want to make this a feature in a row of wall cabinets it is important that this is addressed by someone, as I believe the deadline before manufacture is this Friday. I still await feedback of 15th October with clarification of other items also, and wish to close out the detail urgently.